Can Facebook Compete in Content Curation and Search? In this week’s episode, Robert and I talk about Facebook’s launch of “Paper” and the evolution of Facebook’s graph search into something that may rival Google. We also discuss Chipotle’s announcement of its comedy series on Hulu, and come to the conclusion that nobody has any idea what relevance means, before wrapping up with this week’s #ThisOldMarketing example: iFly Magazine from KLM Airlines. The Launch of Facebook Paper (2:37): Robert and I discuss the purpose behind Facebook’s launch of Paper, and propose some considerations that brands should be thinking about in terms of content curation and media (contributing articles: Mashable, Convince and Convert). Facebook to Compete with Google on Search (9:51): Facebook released its earnings results, and just happened to mention that it has now indexed more than three million searches using Graph Search. CEO Mark Zuckerberg put out the call that the company’s goal is to take on Google for the title of search leader (contributing article: Business Insider/SFGate). Chipotle to Launch Satirical Series on Industrial Farming (16:32): Brilliant! After the success of Chipotle’s The Scarecrow, the Mexican fast-food chain takes its next storytelling step with a four-episode comedy series that will be featured on Hulu (contributing article: The New York Times). 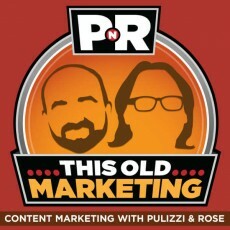 Outbrain Says Relevance Is Overstated (23:25): Have we all been getting relevance wrong? A recent Outbrain survey says that relevant or “similar” articles aren’t usually the ones readers click on after engaging in an online post. Robert and I discuss what relevance really means and how brands can take better advantage of audience behavior (contributing article: Outbrain). Joe’s Rant: I rant about the SodaStream Super Bowl ad, in which the company was caught in a grammatical snafu (where’s a copywriter when you need them?). Joe’s Second Rant: I also raise a bit of a debate about the $4 million dollar price tag for a Super Bowl advertisement, and what amazing content marketing programs could be funded with that sort of investment (contributing article: LinkedIn). Robert’s Rant: Robert complains (without offering a solution) about the rise of cheesy and over-dramatic headlines that nearly every website yearning for traffic is unleashing on the public. Even CNN is getting in on the tabloid-esque action. ThisOldMarketing is very close to bringing on our first sponsor. Before that happens, we thought we’d put out the idea of promoting a free sponsor of the week. If you’d like to be featured in our next podcast, just tweet us at #ThisOldMarketing and we’ll pick our favorite of the lot. This week, we’d like to pay homage to our friend and content marketer Doug Kessler from Velocity Partners. His recent SlideShare piece shows the world how agencies should be marketing their products and services. Now the oldest running airline magazine, Holland’s KLM has mastered the art of visual storytelling with iFly Magazine. I also revisit an article I put together in 2009 on some of the amazing metrics behind this magazine’s ability to drive more business for KLM.